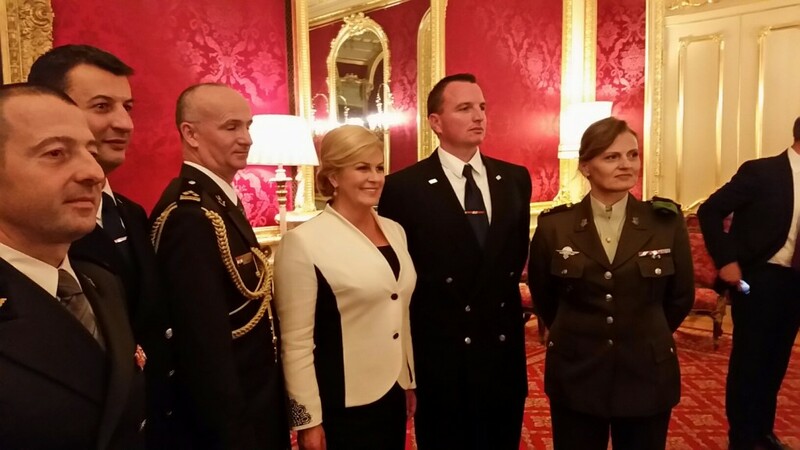 Croatian President Kolinda Grabar-Kitarović came to London for a two day visit on October 11 and 12. I was due to see her speak at the London School of Economics on the 11th at 7PM and also I had invited to be at a foreign office reception for her at 730PM. That was quite interesting; she would not be on time for own her reception, and it would mean some fast moves on my part to get from the LSE to the reception in St. James’s park. Her talk was wide ranging. However, what was probably of most interest to the audience was the issue of Brexit. She did say it was a shock but also a wake-up call for Brussels – the EU must provide answers for its citizens. For Croatia, Britain would remain a trusted ally, and that Croatia was looking for new avenues in the relationship. This was certainly something I was pleased to here. She made it clear that Croatia still believes in the EU project. She took some questions. It was good to see that there were no foolish ones about ‘fascism’ in Croatia or hostile thoughts on Croatia’s Homeland war etc. It does seem that Croatia’s critics in the UK are perhaps not so influential anymore. There were tough and relevant queries including from someone who felt that she had better opportunities in the UK than in Croatia. The President gave a good impression and at around 8PM her entourage left. The audience in the hall had to wait 5 minutes to allow her to go. This prevented me from having a chat with familiar faces but I managed to jump into a taxi and get to Commonwealth House. I was just in time for short speeches by Europe Minister Alan Duncan MP and the President. The reception was full of familiar people from the British Croatian Society and the Croatian chaplaincy. West Ham football manager Slaven Bilić was also in attendance. Many of us took the opportunities for selfies with the President and Mr Bilić. The President took the time to have quick chats with people, and I was delighted to exchange a few words with her. It was an enjoyable evening, and indeed the two day trip can easily be considered a success. The Croatian embassy in London and the UK foreign office should be congratulated on a good job.